IMAGINE IF YOU HAD THE CHANCE TO BUY A WAL-MART FRANCHISE IN MEXICO RIGHT WHEN IT FIRST OPENED ITS DOORS, AND ALL YOU NEEDED WAS A SMALL STAKE TO GET IN. HURRY, WE SEE THIS STOCK STARTING TO MAKE THE TURN NOW. BIG WATCH IN EFFECT FOR NOVEMBER, 15TH, 2009!!!! What a great guy this must be to send me this information and to be so concerned about my financial well-being! The truth is that this email is a classic example of bait for a pump and dump scam. 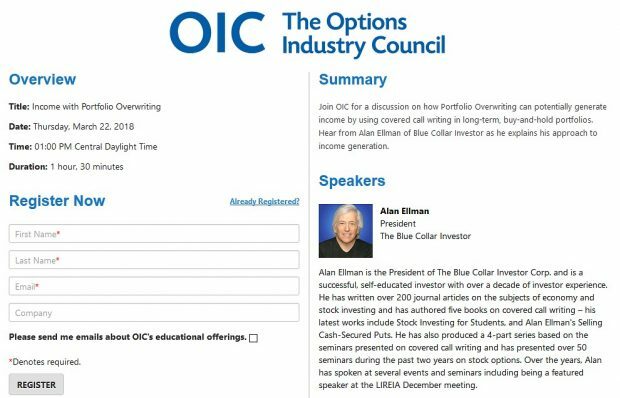 This is a form of microcap (companies with under $250 million in market capitalization) stock fraud which attempts to artificially pump up the price of an equity through false, misleading, or exaggerated statements. The perpetrators of this scheme, who already have a position in the stock, dump their securities after the hype has caused a higher share price. The victims then lose a considerable portion of their investment as the price subsequently plummets. Perhaps that fellow who sent the email wasn’t such a nice guy after all! In the past, pump and dump schemes were initiated through cold calling, but the internet has opened the door for a new breed of fraudsters. The internet provides a cheaper, easier and faster avenue by which these scammers can reach huge numbers of unsuspecting victims. We must not let greed and temptation overtake our sense of reality. We know how to locate great investment opportunities through fundamental and technical analysis. This is a far superior approach than listening to “some guy” who we never met. Oftentimes these scams take on multi-level, more sophisticated formats. There can be email and telemarketing campaigns supported by newsletters highlighting the company as a “hot stock pick.” Chat rooms are flooded with pleas for investors to “hurry-up and buy this red-hot stock.” Give me a ____________break (feel free to fill in the blank). Pump and dump scams work best with small, thinly traded companies called “penny stocks.” These are equities that trade at a low price (under $5 per share) and have a small market capitalization (# of outstanding shares x share price), generally under $250 million. Micro cap stocks usually trade over-the-counter through pink sheets and bulletin boards, and are considered high risk due to their lack of liquidity, large bid-ask spreads, and limited analyst following and disclosure. There is also a class of even smaller companies called Nano Caps which have market capitalization under $50 million. This is a related illegal action taken by some market manipulators wherein they buy and sell securities amongst themselves to create artificial trading activity which is then reported on the ticker tape. Unsuspecting investors may falsely perceive the seemingly high volume of activity as institutional interest and take positions in the stock. The fraudsters then sell their own stock after the price of the stock is artificially inflated, while the unsuspecting retail investors take the hit. The SEC is all over this one as well. Forget about that Wal-Mart in Mexico and let’s stick to our system of fundamental and technical analysis to locate our investment candidates. This will protect our hard-earned money and force those con artists to get real jobs, just like the rest of us. It is more important than ever to educate ourselves so that we can meet the challenges the world economy is creating. This can absolutely be accomplished through fundamental, technical and common sense principles of investing. Education is power and I thank all our members for assisting me in creating this venue where we can all learn from each other. A few financial radio programs have contacted me about discussing my new book. I will post the dates and times when finalized. For the week, the S&P 500 declined by 3.8% (ouch!) for a year-to-date return of (-) 1.6% including dividends. BCI: With excellent economic reports and a market declining by 3.8% this week, the need for a defensive approach to investing our hard-earned money makes perfect sense to this investor. This site remains cautiously bullish selling predominantly in-the-money strikes. How about Walmart stock itself. I don’t remember ever seeing it on your stock list? With the Super Committee report coming out Weds (ro not) is it a good idea to may wait until after Thanksgiving to make this months trades? 3 of my five stock will go away and I’m considering giving up a week of return to see what happens. I just received your calculator and I’m reading through the user guide. It looks user-friendly so far. My question is how often and when do I do these calculations. Thanks for your help. WMT is a great company oftentimes with top-tier fundamentals and technicals. However, it is one of the corporations on our “banned” list of stocks because it reports same store MONTHLY retail sales stats. These monthly reports present the same risk as earnings reports which we avoid in the BCI methodology. In our system, it’s okay to shop at Walmart, but not use its stock for covered call writing. Sorry Sam! Is your calculator good for Apple Mac Book Pro or only Microsoft Windows? Thanks in advance. You bring out an excellent point about the Wednesday deadline but I can’t help but think that Europe is still the major market mover short term. Besides who’s expecting Congress to actually get something done? The Premium Weekly Report has been uploaded to the Premium website and is available for download. Calculation results are in a constant state of change as stock price, implied volatility and time to expiration changes. Therefore, the best time to run these calculations is when you are preparing to execute trades. Running calculations days prior to execution is not necessary. We have a significant percentage of our membership that use the Ellman Calculator on their Macs. As a matter of fact my brother-in-law has been encouraging me to switch. If you have any issues let me know and I’ll speak with my tech team to see if we can resolve the problem. The decision by the “super committee” comes today becuase they will need 2 days to get accounting confirmation. Looks like it failed to come to a compromise and the impact on the market should be clear today. Anyone familiar with Peter Lynch Rule of 20? Supposed to be a positive sign for the market despite what’s going on today. Any help appreciated. Anybody have any insight on TPX it dropped much more than the market. I have that one too. Couldn’t find a thing and I looked all over. Hoping for a market bounce back later today. Good move. There’s plenty of time left for a bounce back. Peter Lynch’s “Rule of 20” states that a market equilibrium P/E ratio should be equal to 20 minus the inflation rate. This rule implies an equilibrium P/E ratio of approximately 18x times earnings when the current 2011 P/E ratio is slightly above 11x times earnings. This means that stocks are “cheap” and could go higher to meet the “equilirium” of the rule. I do agree that stocks are cheap but global and now political issues are interfering with normal market movement and resulting in higher-than-normal market volatility. 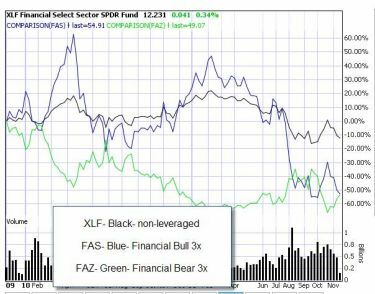 Why don’t you include leveraged etfs in your weekly reports? The unleveraged ETF has declined by 11% over the past 2 years while both leveraged ETFs declined more than 50%. In my view, they are NOT for covered call writers. Click on the chart to enlarge and use the back arrow to return to this blog. Does you new book contain all the exit strategy information found in your second book? I already read Cashing in on Covered Calls and loved it. Chapter 10 in my new book (Encyclopedia…. )DOES contain information on all exit strategies discussed in my second book (Exit Strategies for Covered Call Writing) plus additional strategies I developed after publication of my second book. The book devoted solely to exit strategies does contain many more examples of each strategy. On October 20th, PM reported an outstanding 3rd quarter earnings report with revenues up 37% and an earnings increase of 26% year-to-year. Operating income rose 30% over the past year. Management increased earnings guidance for both 2011 (25%) and 2012 (8%). This represented the 4th consecutive positive earnings surprise. In addition, PM is generating so much cash that it bought back 21.2 million shares for $1.4 bIllion increasing share value. It also raised its dividend by 20% for a current yield of 4.2%. PM trades at a reasonable 14 x forward earnings and a price/sales ratio of 1.7 below the industry average. Our premium running list shows a beta of 0.61 and an inustry segment rank of “B”. I was completely wrong on TPX. It blew right thru the 55 support and is down around 50 now. There was a report on CNBC about a new Gel based bed which is seen as the first real competetion to them.